3D Gauge in the ThingWorx Help Center. Location of the text on the X-axis with respect to the canvas. Location of the text on the Y-axis with respect to the canvas. Location of the gauge on the x-axis. Location of the gauge on the y-axis. Location of the gauge on the z-axis. Rotation of the gauge about the x-axis. Rotation of the gauge about the y-axis. Rotation of the gauge about the z-axis. Location of the gauge on the X-axis with respect to the canvas. Location of the gauge on the Y-axis with respect to the canvas. Allows you to choose when the canvas size is overridden. Select one of the following options. If set to true, the geometry of a widget is invisible, but at the same time hides any other augmentations behind it in the 3D scene. 1. Drag and drop a 3D Gauge widget onto the canvas. 2. From the Data pane, search for an entity that has a service with a numeric property. 3. Once the service has been added, drag and drop a numeric property under Current Selected Item onto the widget and select Text on the Select Binding Target window. 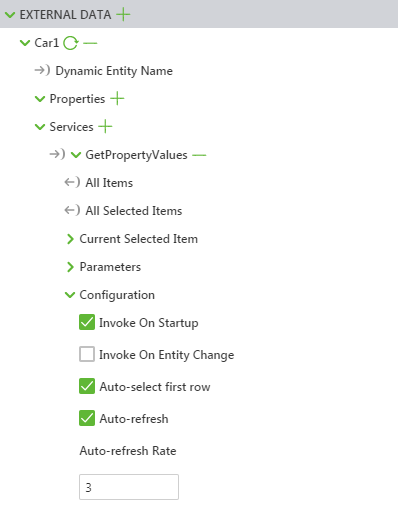 From the Data pane, be sure to select Invoke On StartupServices > Configuration.